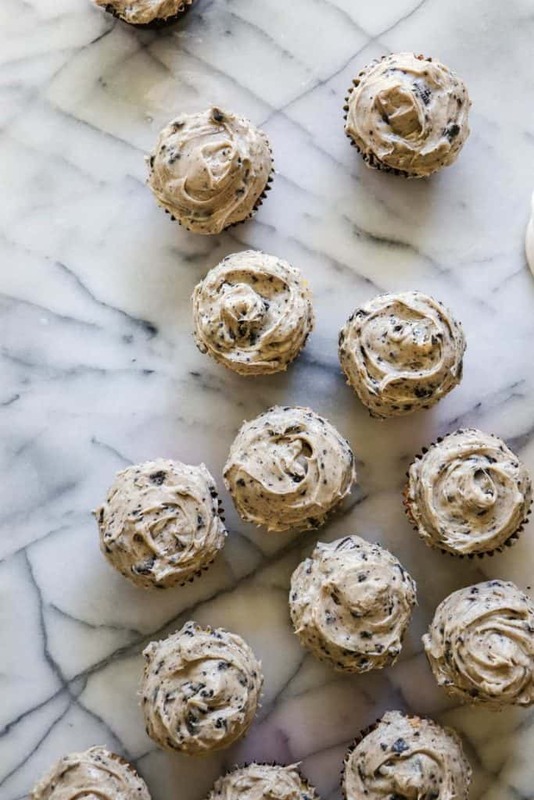 Hi there loaded cookies and cream cupcakes. I see you over there. Looking all fluffy and perfect. Child number 2 turned 11 this last week. And her request for her birthday? 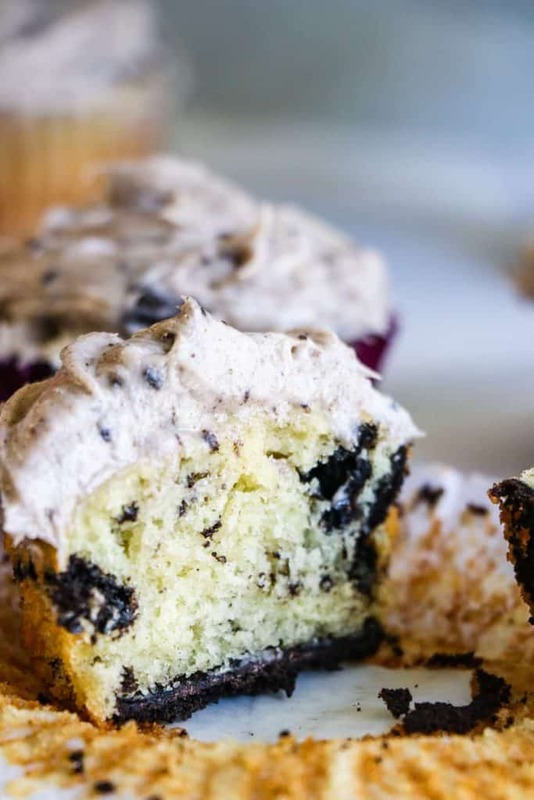 These cookies and cream cupcakes. These were a favorite amongst the fam since before this blog was even a thought in my mind. So why were they not on here to share with y’all?? I have no excuse other than pure laziness. Or is it busyness? Not that I’m typing this out surrounded by laundry on the couch.. The hazards of working at home. 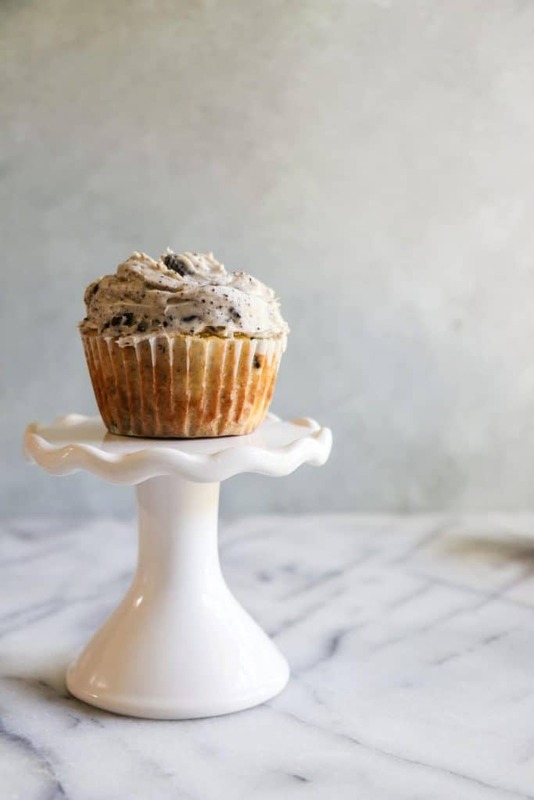 These cookies and cream cupcakes are made using the Perfect Vanilla cupcake recipe on the site from last year. The difference? These cupcakes are seriously loaded up with cookies. From the cookie on the bottom of the cupcake to the chunks throughout the cake, to the speckled frosting swirled on top. I was going to go even further and cut out the center of the cupcakes and add a little cream filling. Yet lack of time (and ingredients on hand) quickly dashed that thought. Maybe if you’re feelin’ it you can go for it and make sure to take a pic to share with me and make all my cupcake dreams come true. Just double up the frosting recipe..don’t add the crushed cookies, separate half for the filling and pile the cookies into the other half for the topping. Then just cut out the center of the cupcakes, I always use an apple corer to get this task completed painlessly. Use a pastry bag or regular plastic bag with the corner cut off to fill in the center with creamy goodness. It’s extreme. It’s delicious. It’s such a good idea. 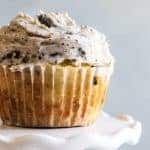 These Cookies and Cream Cupcakes are loaded with not just chunks of oreo, but an entire oreo on the bottom. 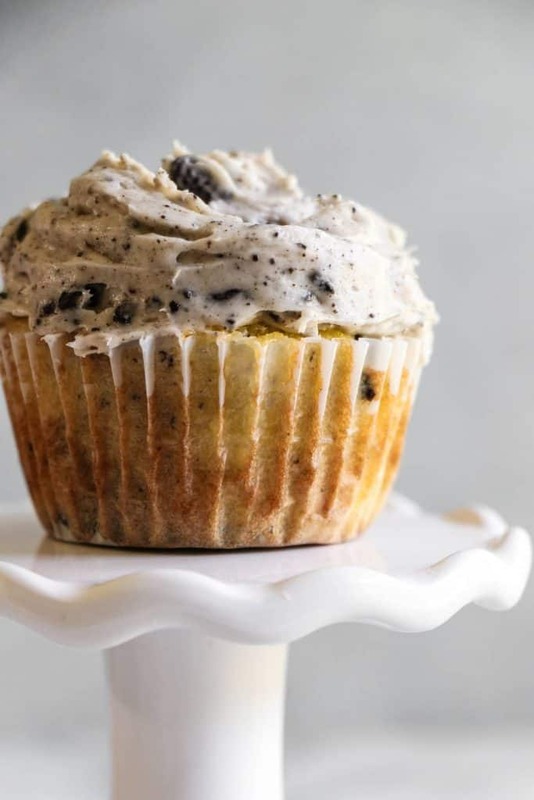 All topped off with a beyond creamy cookies and cream frosting. Preheat oven to 350 degrees. Line muffin tin with cupcake liners, place a half of an oreo in the bottom of each muffin liner, cream side up. Set aside. In medium size bowl combine the flour, baking powder, baking soda, and salt. 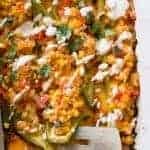 Whisk the dry ingredients together to incorporate. Set aside. In mixing bowl add the room temperature butter. Beat on medium speed for about 1 minute to loosen up the butter, add in the sugar and beat on medium speed for about 2-3 minutes to cream the butter and sugar together until light and fluffy. Add in the vanilla extract and add in the eggs one at a time, mixing in between. Mix in the greek yogurt. Remove the bowl from the stand mixer. Slowly add in 1/3 of the dry ingredients, then 1/3 of the milk. Mix with a rubber spatula gently, just until most of the flour is incorporated, not fully mixed. Continue with this method until all the milk and dry ingredients are added. Gently stir the batter to incorporate all the dry ingredients, it’s ok if there’s some lumps in the batter. Don’t overtax. Gently fold in the crushed oreo. Scoop the batter into the cupcake liners filling them about 2/3 full. Bake for 15-16 minutes until fully cooked, tops will be golden and a toothpick inserted into the center will come out clean. Allow to cool in the tin for 2-3 minutes and then carefully remove cupcakes to continue cooling on a wire rack. Add the cream cheese and butter into a small mixing bowl. Beat on medium speed until smooth and creamy. Add in the powdered sugar and vanilla extract. Continue to beat on medium speed until combined. Fold in the crushed oreo. If you need to thin out the frosting add a little milk or cream. If you need to thicken the frosting add a bit more powdered sugar. 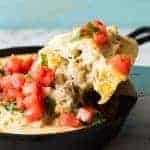 What a wonderful recipe I think is very creamy and tasty I’m going to make for the birthday of what I’m doing. Can you sub the yogurt for buttermilk? 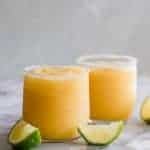 I haven’t tried making that substitution with this recipe yet. 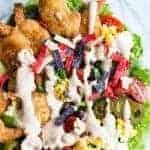 I imagine that it would work since the buttermilk will be doing the same thing as the greek yogurt and it is still an acidic wet ingredient too which shouldn’t throw off our leveners either.If you try it out please leave a comment and let me know!